Trim the fat off the pork and freeze the meat for 30 minutes or until it is a little firm, which makes it easier to cut. Finely mince the meat with a sharp chef's knife. In a small bowl whisk together the sesame oil, soy sauce, Sriracha sauce, and cornstarch until smooth; set aside. Heat the vegetable oil in a large skillet over high heat. Add the garlic, ginger and shallot, and stir-fry for 1 minute. Add the pork and continue to stir-fry until it is cooked through, about 3 minutes. Add the soy sauce mixture and continue to cook for 2 minutes, stirring constantly. Transfer the mixture to a serving bowl and stir in the cilantro, mint, green onions and lime juice. 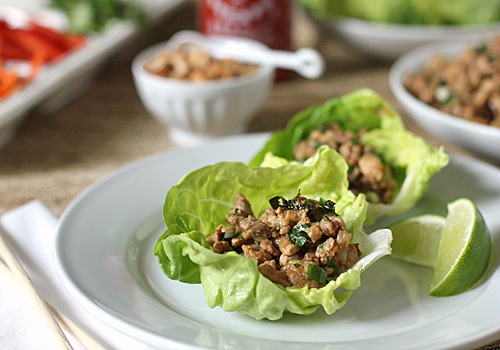 Decorate a serving plate with the lettuce leaves and accompaniments to serve alongside the pork mixture. Enjoy! 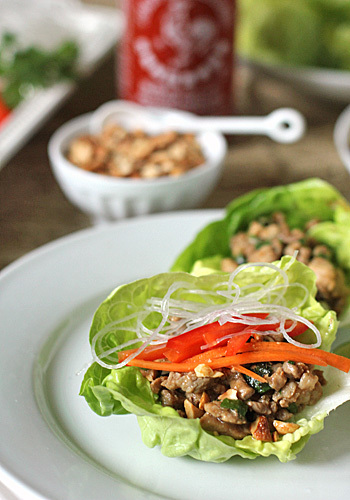 These look awesome-I love lettuce wraps! Made them tonight (minus the srirach sauce which I didn't have) and they were absolutely delicious! They reminded me of "nems" that we eat in France. Thanks for another winner Nicole!! Ahhh yum! That looks delish!! These were great! We just started the South Beach Diet (per doc's orders, sigh...) and these were perfect for the intense, no-carb, no-wine, no-fun first phase! Thanks. Will be sure to make them again!